Using the different near infrared reflectance is one of the tools we have to discriminate between two crops. 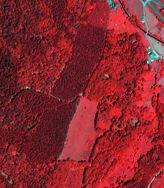 When it comes to identifying trees and crops or grassland, there is another clue we can use. 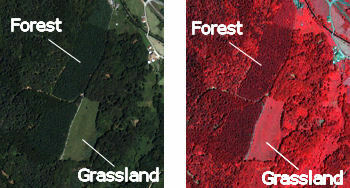 True and false colour images of a forest and grassland in France. 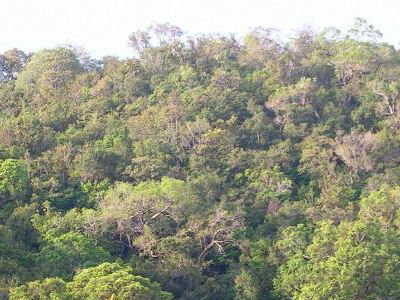 The two images above show a forested area with a patch of grassland in the middle. Apart from the difference in the colour, what other difference is there between trees and grassland? (Look at the images on the left for a clue). 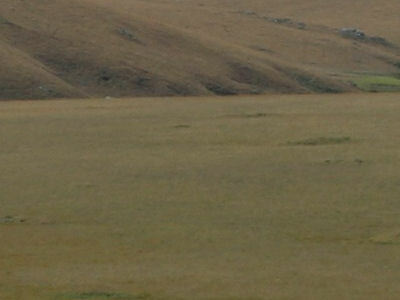 The grassland appears to have a smooth surface, but the trees appear more rough. Because the tree canopies are not flat, the surface of a group of trees causes shadows. These shadows appear as small darker areas, because less light is reaching them and proportionally less energy is reflected. This gives them this rough texture. 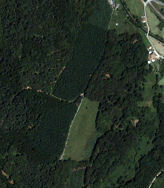 In the two satellite images above, the forest appears darker because of those shadows. If we were to remove all the branches of a tree and lay them flat on the ground, the reflectance in the near infrared would be higher and appear in a stronger red colour.